John F Kennedy was the most popular president of the United States. His assassination in 1963 deeply saddened American society and the whole world. In 1964 a legal tender half dollar coin was struck by the United States to commemorate his short presidency. This half dollar silver coin is a precious original more than 50 years old, it was struck for circulation for only one year. From the moment it was issued in 1964, it was hoarded by collectors not just because of its 90% silver content but also as a tribute to JFK. As the first and only circulating silver coin commemorating John F. Kennedy it has become one of the most collected silver dollar coins all over the world. 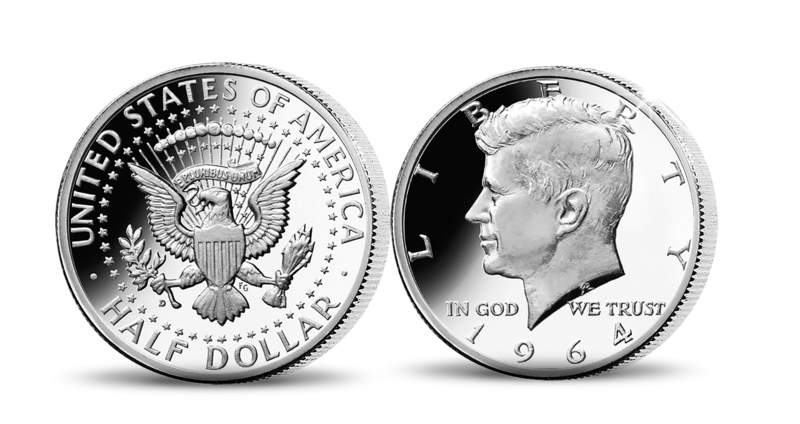 The JFK Half-Silver Dollar is just the first coin in The US Heritage Silver Collection. This collection comprises six original US silver half and six original full dollars, each of which is a significant first or last. 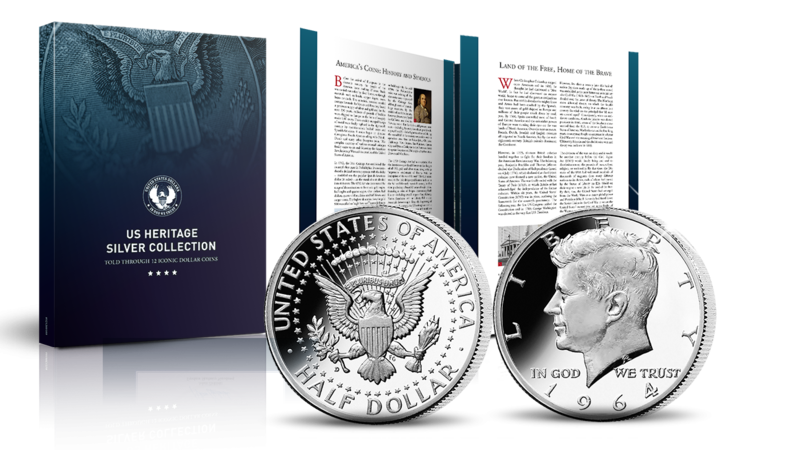 Struck in solid 90% fine silver, the traditional purity of American silver coins, together they tell the short but eventful history of the United States, from the discovery of America in 1492 to the tragic assassination of JFK. Just like the Kennedy Half Dollar, the six half-dollars are significant first or lasts, including the iconic 1916-47 Walking Liberty and the historic 1892-3 Columbus Exhibition US Silver Commemorative Half Dollar - now over 100 years old! All six full dollars feature iconic symbols of US - from Mount Rushmore to the Statue of Liberty. Each silver coin comes with a Certificate of Authenticity. Each of the 12 silver coins in this collection are genuine American coins, some of them dating back over a century. Struck in solid .900 fine silver, the traditional purity of American silver coins, they pay tribute to some of the greatest figures and greatest moments in American History. Many of these historic coins are now difficult to find. Thereafter each of the remaining 11 coins in the US Heritage collection, will be sent to you at monthly intervals, always on approval and without any obligation. The five Half Dollars coins are £39.95 each and the six Full Dollar coins are £59.95 each (+ £2.95 P&P). Receive your FREE scale reproduction of the most valuable coin in the world - the Flowing Hair Dollar. The original recently sold at auction for a record $10,016,875. The US Heritage Silver Collection comprises six original US silver half and six original full dollars, each of which is a significant first or last. Each one is struck in solid 90% fine silver, the traditional purity of American silver coins. Together they tell the short but eventful history of the United States, from the discovery of America in 1492 to the tragic assassination of JFK. Just like the Kennedy Half Dollar, the six half-dollars are significant first or lasts. the set includes the iconic 1916-47 Walking Liberty - one of America's most sought-after coins, widely considered one of the most beautiful ever minted. As well as the historic 1892-3 Columbus Exhibition US Silver Commemorative Half Dollar - now over 100 years old! All six full dollars feature iconic symbols of the US such as the 1991 Mount Rushmore US Silver Proof Dollar, the Statue of Liberty US Silver Proof Dollar, and the Capitol Bicentennial US Silver Dollar. Each silver dollar comes with a Certificate of Authenticity attesting to its precious metal content. Thereafter each of the remaining 11 coins in the US Heritage collection, will be sent to you at monthly intervals, always on approval and without any obligation. The remaining 5 Half Dollars coins are £39.95 each and the 6 Full Dollar coins are £54.95 each (+ £295 P+P). Am I committed to buying further coins? No. In fact, you aren’t even committed to buying this first coin. If, after receiving it you decide not to keep it, simply return it within 14 days and owe nothing. Each of the remaining coins in your collection will similarly be sent to you entirely on approval, you only need to pay for the coins you wish to keep. You can stop collecting at any time just call us to let us know. This enables you to only pay for the coins after you have decided to keep them and build your collection at a pace that suits you. Buying from us - 100% satisfaction guaranteed. By collecting through The London Mint Office, collectors ensure that they receive the latest news and the best quality coins, complete with essential collector documentation such as certificates of authenticity.